The weekend leading up to Birdy’s birth we had dedicated solely to utilizing natural ways to prepare my body for labour, as well as hopefully help my body get labour started on it’s own. The interesting thing about our bodies, is that they aren’t going to “go into labour” until they’re ready, even if you do a thousand and one things to try and make that happen; if there’s one thing I’ve learned through this entire process, it’s that the human body is beyond anything my mind can even comprehend. It is absolutely filled with untapped wisdom, guidance, knowing, and strength that I cannot even begin to put into words. Before getting too far into this, I need to iterate how important education throughout the whole pregnancy journey has been for Mark and I. I’ve shared throughout prior Barefoot Baby posts how skewed society’s view on labour and delivery is, as well as how much misinformation we are inundated with in tv shows, movies, and even documentaries, and after going through this whole process from start to “finish”, I have never been more thankful for the choices we made when it came to educating ourselves. I usually don’t vouch for too many things as strongly as I’m about to vouch for these birth classes, but if you are in Calgary (or even if you’re not--they actually have a distance learning program) and are expecting a baby, I cannot encourage you strongly enough to check out Healthy Birth Choices; they are majorly responsible for Mark and I being able to have a confident, fear-free, and informed labour and delivery. I cannot even put into words how crucial that course was not only in preparing ourselves for this experience, but also for allowing our natural home birth to go so smoothly. Back to the weekend leading up to her birth, we wanted to try a few more natural methods to get my body prepped for labour. I had only just gone over my “due date” by a few days at this point (again something that really isn’t a good guidepost for labour and delivery; due dates don’t hold all that much water). Up until this point, there was already a few daily things that I had been doing ever since 37 and 38 weeks pregnant that were also intended to prep my body for labour, and those were taking Evening Primrose Oil capsules twice daily, taking EZ Birth Homeopathic remedy, as well as drinking Raspberry Leaf Tea. All of these things listed previously are all intended to help prepare your cervix for labour, which is a pretty crucial part of the entire operation. Bouncing on an exercise ball was also something that was happening any time that I was sitting down; it replaced my chair at my computer, as was also where I sat whenever we watched TV or movies. Using a hula motion on that ball or just doing little bounces are intended to help keep your hips open, as well as aid in bringing baby’s head downward; both of which are also major keys in getting labour going. We also made numerous loops around a handful of local malls (since it was too cold and icy to be walking outside a whole bunch), and even found a massive set of stairs in the mall’s movie theatre (since we don’t have stairs in our house) that we walked up and down for quite some time. We tried to balance all of the walking with equal amounts of rest time back at home where Mark would massage certain reflexology points on my feet and lower legs that I was taught about during the two reflexology appointments that I had also had that week in order to help coax labour into starting. Lastly, we also utilized aromatherapy in our diffuser as well as on the reflexology massage; Jasmine and Lavender were the two essential oils that we utilized. The end of the weekend came and went without much visual “progression”, but nevertheless it was such a wonderful weekend where we were able to spend some really intentional and slow quality time together. Tuesday’s midwife appointment rolled around and at this point I was 40 weeks and 6 days. Up until now, I had declined two prior membrane sweeps at my two earlier check ups just because we didn’t feel they were necessary quite yet in getting things going, but seeing as we were basically at the 41 week mark, we went ahead with a stretch and sweep as a natural way to aid things alone. As a sidenote, in case you’re not too familiar with labour, there are various stages of labour with the first being early labour (0-4 cm dilated) which can last up until 24 or 36 hours and is the more mild stage of labour where you’re also encouraged to just continue on with daily activities or to rest up if it’s night time before the more intense stages begin. My midwife checked me and discovered that I was already 2cm dilated at our appointment and 50% effaced, which meant that my body was already halfway through early labour without us even being aware that that’s what was going on; I hadn’t felt any contraction strength with the exception of braxton hicks that had been happening for a few weeks, but aside from that everything else had taken place in a wonderfully unsuspecting way. Wanting to maintain that progression, we did more walking, curb walking, and stairs that evening before more relaxing and then eventually heading to bed just before 11pm. 12:00 am rolls around and I’m being awoke by some relatively strong contraction pain. Up until this point in my pregnancy, I was fortunate to not have any cramping, or pain, or spotting whatsoever, so feeling these cramps almost ten months into this journey was a totally new and unfamiliar feeling; I felt it in my gut that this had to be the contraction pains that I was trying to anticipate. I want to use the word pain sparingly because it’s not a good way to describe what contractions really feel like (at least not to me). They aren’t painful in the sense that you feel as though you’re in danger or that there is something wrong, it’s more so a sense of strength and power that comes in varying waves. They are so strong and grow to be unbelievably intense later in labour, but they aren’t really the sensation of what I would correlate with the word pain. The contractions were feeling relatively strong and were coming every few minutes which was making it not overly possible to fall back asleep, so I wandered out into the living room in the hopes of maybe utilizing an endless stream of the Gilmore Girls to help lull me back to sleep. It was also really important to me to let Mark get as much sleep as possible in case this was actually the start of labour; I wanted him to be well rested for what was to follow. I laid on the couch trying to take my mind of off the contractions, but it was so hard to occupy my thoughts with anything else simply because they were coming so frequently. I had expected them to start out being 10-20 minutes apart, but they were always within the 4-7 minute range for me right from the get go. I lulled in and out of a very shallow sleep for the next few hours. When I woke up around 3:00am, I couldn’t believe how close my contractions seemed, so I downloaded the app that helps time their duration and frequency, and begun to document them. For the next hour they remained consistently around 5 minutes apart, so when 4:00am rolled around I went back into the bedroom to wake Mark up. It had decided to start dumping snow earlier that evening, so I needed his help in deciding when to contact our photographer seeing as she lives an hour and some outside of Calgary and I had no idea what the highway conditions would be like. Mark reiterated to me how important that it was for me to try and get a tiny bit of sleep if at all possible, so after deciding to wait on letting anyone know what was going on, I crawled back into bed in the hopes of getting some sort of rest. For the next two hours I laid on my side, breathing my way through the contractions that were now coming every 4-5 minutes. At 6:00am we finally decided that it was time to get up and help move things along seeing as we were both now fully convinced that we were in the heart of labour and that this baby was starting its journey Earthside. We continued timing contractions as Mark began prepping the house for labour and delivery; this included things like blowing up the pool, lighting candles + incense, remaking the bed with a plastic liner and old sheets, putting towels/sleepers/toques in the dryer, prepped the crock pot with hot compresses, taped our address + phone number to the back of the door, shoveled the walkway, and prepped pots full of water atop the stove. Meanwhile, I was wandering around the house attempting to make some oatmeal for breakfast and having to stop every couple of minutes to work my way through a contraction. The intensity was already picking up and I was having a hard time focusing on anything else when a contraction wave came on. Wandering around the house and pausing during contractions was the only way that I was able to somewhat manage the power waves. Around 6:00am was also the time that we decided to call Brittany--our photographer--and she soon after headed out of Canmore to make her way to Calgary; once she got into town we decided that seeing as things seemed to be progressing so quickly that maybe it was best that she came straight to our house. At this point, I was starting to feel a little antsy, simply because I didn’t anticipate things moving at such a quick pace. With our midwives, their rule is that they’ll arrive once you’re in active labour (which is the second stage after early labour) and when you’re contractions abide by the 4-1-1 rule, meaning that they are lasting for a minute in length and happening at most four minutes apart for the duration of an hour. Mine were consistently true to the 4-1-1 rule from 7am to 8am, so at 8am Mark called our midwife team and spoke with Rebecca, our teams on call midwife that day. It was also important to us that we notify her at the signs of active labour because I had tested positive for Group B Strep earlier on in pregnancy, meaning that I had to have some antibiotics administered via IV either at the start of active labour or when my water broke, whichever came first. After Mark juggled chatting with Rebecca answering her questions and pausing to help me with applying counterpressure to my hips during my quickening contractions, she was going to pack up her gear and head over to our house. Rebecca arrived around 9am, and after taking a peek at my contraction app and getting a feel for how things had been progressing up until that point, we decided that she’d check my blood pressure, baby’s heartbeat, and my cervix. I slowly made my way to the bed and laid on my back, having to pause to either roll over or stand up in order to work my way through the endless waves of contractions that were coming almost back to back. She checked me and I think we were all a little shocked to learn that I was already 6cm dilated and 90% effaced, meaning that I was well into active labour. The next few hours for me aren’t quite a blur, but they definitely take on a different space in my memory. Soon after being 6cm dilated, it’s almost as though my body was gearing up to change into some sort of survival mode/instinct. I feel as though from that point on I had turned completely inward, focusing every single ounce of energy and concentration that I could muster into making it through each powerful surge. It was important to me that Mark reminded me during the process to truly focus on one step at a time; not worrying about what’s to come next or how the following contraction would feel, just one small step at a time. Although I was deep in some sort of out of body zone, swaying my hips and wincing through each minute and a half to two minute in length contraction, there are very clear pieces from my surroundings that my mind tuned into. I still at this point cannot even begin to fathom nor put into words how unbelievable my tiny support network was on that day; I knew Mark would be the biggest and best support that I could possibly need, but the support and words of encouragement that also came from Rebecca--our midwife--were also so crucial to me following through with the entire process. I can still hear their words of encouragement, somehow knowing exactly what to say and when to say it, their compassionate touches of silent support, their words of belief in who I was and what I was going through. It brings me to tears thinking about how kind hearted and supportive people can be when you yourself feel as though you aren’t even able to help yourself; when you’re so focused at what feels just like surviving at the time, and they’re there to be these silent pillars of unparalleled strength and unwavering guidance. Gratitude. Gratitude. Gratitude. Movement was the only “relief” at this point. I wandered around tirelessly, pausing every minute and a half to either grasp the top of a door frame, or to cover my head with my arms and press my upper body against a wall or doorway. Although I can’t feel the intensity of that pain right now as I type this, I vividly remember one of the thoughts passing through my mind right before a contraction would take over, and that is that all my body wanted to do was escape the feeling that I knew was coming, but being unable to run from it since it was coming from within my own body. As I twisted and moaned through the final stages of active labour, the pool was being prepped with a final dose of hot water by Mark, Rebecca, and Brittany our incredible photographer. I still can’t quite remember where in the house I was situated as “transition”--the final stage of labour--approached, but I can remember how I felt and other details surrounding me as clear as day. Again if you’re not familiar with labour, transition is the final stage of labour before pushing; it’s the last few cm of dilation--between 7cm and 10cm--and is when you start to feel unbearable amounts of pressure as the baby begins it’s descent downward. It often also triggers some serious self-doubt in the labouring women as the whole process feel so unbelievably intense and no longer doable. I can remember sputtering words of self doubt and twisting my body back and forth from the pain. I can remember having no sense or care for anything else that was happening around me and just trying to physically make it through the endless surges. This truly was a moment in time unlike anything I have ever come close to experiencing in my life, and even now, looking back, I’m still in awe at how my body was able to carry me through that. I can remember hearing Rebecca’s words: “This is transition Kaihla, this is the hardest it’s going to be, you’re doing incredible”. I can remember Mark’s touch and unwavering presence; always right next to me through every moment of each contraction and moment of doubt. As Rebecca prepped a table full of equipment, I remember asking Mark if I could get into the pool. It was also at that point that my body was already gearing up for the next stage of labour and I remember expressing multiple times that I needed to push and just couldn’t wait any longer. My body was one hundred percent operating on it’s own unparalleled wisdom and knowingness and I was simply the beating heart ensuring that it had everything it needed in order to bring this baby Earthside. Up until now with being fully dilated and effaced, my water had yet to break which I feel carried both a pro and a con; the pro being that Birdy was still fully “protected” by her bag of water, which I think played a role--paired with her super quick delivery--in her coming out without a bruise, scratch, or head squishiness of any kind. On the other hand, having my water still in tact was potentially contributing to it being harder to push, seeing as I was trying to push a pressurized bag of water through my cervix as opposed to just a baby head and body. After pushing for about half an hour in varying positions in the pool, I vividly remember just wanting this all to be over with. Each contraction coupled with the unstoppable urge to push would leave me whimpering and on the verge of tears. As each wave subsided I kept uttering how I couldn’t do it anymore and how it just needed to be over. Mark has mentioned that these were the hardest moments for him and how he just knew that he had to keep me from breaking down into tears. Rebecca reassured us both that everything was as it should be: “Everything is going so well Kaihla and Mark. One hundred percent. One hundred and fifty percent”. It was around this time that I heard the second midwife and her student arrive at the house. Rebecca crouched next to me and explained to me between contractions that if we chose to, she could break my bag of water for me in the hopes of it potentially speeding up this final stage of labour. It’s not always guaranteed to speed things up, and there are a few risks associated with manually breaking the water, but at that point I remember looking to Mark with pleading eyes and expressing that if this would in any way make this over quicker that I wanted to do it. Contractions kept coming and in between them, Rebecca went on to explain the risks associated with her breaking my water. After another contraction she asked for our decision and I said to do it. Another contraction and huge urge to push took over as she put on a glove and got out the plastic tool they use to break water. She knelt by the edge of the pool waiting for the contraction to end when I expressed that I felt a small pop during that last contraction. The only thing that could have possibly been was my water breaking, but the timing seemed too wild, so she checked me once more following another contraction and sure enough I had broken my own water just seconds before we were about to do it manually. I was also 10cm dilated and fully effaced. After a few more big surges of pushing in varying positions, Rebecca mentioned that maybe we should get out of the pool and try delivering on the bed, as often times a shift in position can help baby make it’s final turn through the pelvic bone before being delivered. I was so unbelievably drained at that point that I could no longer even make a decision for myself. I thought that there was no way I could possibly stand up, let alone walk from the pool to the bed. I remember looking up at her and repeating “I don’t know, I just don’t know” over and over. She asked if I wanted them to decide for me, and I remember agreeing wholeheartedly, not wanting to have to choose anything for myself anymore. She smiled and said “okay let’s get you to the bed then”. The other two began to lay down towels from the pool to the bedroom as Mark and Rebecca helped my tired body to stand. I swung one leg over the edge of the pool, gained my balance, and then proceeded to pull my second leg out of the water. Before it was even firmly planted on the floor I was one hundred percent overtaken by the strongest urge to push and the sheer knowingness that this baby was coming now. Without even taking a step, everyone aided me in laying back with my body being fully supported by Mark’s. Not ten seconds later a huge contraction washed over me as I pushed for the first of three times, allowing Birdy’s head to crown. The second push brought out her entire head. And the third push got out her entire body. All I could hear was Rebecca’s breathing guidance and direction followed by her expressing for Mark and I to both reach down and grab our baby. After being able to bask in what I can only explain as an overwhelming frozen period of time of inexpressible bliss, we cut her cord and she was eventually given to Mark so that they could move me to the bed in order to mend a small tear (thank you Bird for coming out with your hand snuggled next to your face haha). After a quick stitch job, Rebecca got Mark, Birdy, and I situated cozy in our bedroom while the three of them proceeded to go above and beyond what I would have ever expected them to do. My unbelievably wonderful midwife, our backup midwife, and her student, proceeded to drain the birth pool, pack it up, tidy the entire house, tend to the garbage, and put in a load of laundry. For almost an hour, they allowed us to snuggle together as a family of three before even giving Birdy her full newborn exam. Once everything was tidied, Rebecca came into the bedroom and did all the usual checks with Birdy at the foot of our bed. Her loving presence carried through as she spoke so softly and handled Birdy with so much love and gentleness; it was so wonderful to watch. After her checkup was complete and everything came back good and well, our unbelievable team made their rounds to say their goodbyes with hugs and more words of encouragement before leaving the three of us alone in the comfort of our own home. My parents, sister, and nephew also popped in for a quick hello as the midwives were finishing up. It was around 3:30pm when everyone left our house, so we had the whole rest of the sunshine-filled day to lay exhausted with one another and take in the most incredibly unbelievable sight that was our daughter, Birdy Lennon Mae. 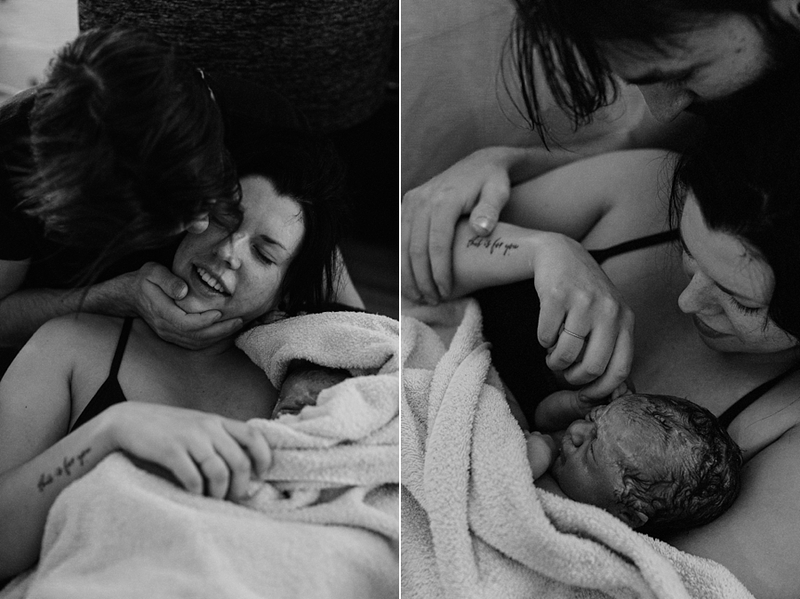 I remember sitting in bed with Mark that night, the both of us in complete awe of all that had just taken place; unable to fathom the thought that our home birth had come and gone, and beyond that, it came and went with such a sense of comfort and safety. The entire process from start to finish could not have gone any better; we could not have scripted a more wonderful experience if we had tried. We’ve explained to a few friends thus far how although that day was filled with more exhaustion and hard work than I could even deem imaginable, there wasn’t a single moment throughout the entire journey that fear ever once entered my mind (or Mark’s). Not once was there an unwelcome sense of urgency, or compromised safety, or worry, or panic, or unknowingness. Our education with labour and delivery’s natural intended progression gave us such a sense of confidence going into our own labour and delivery journey simply because we were aware of how things were supposed to progress, as well as what signposts to look for during the various stages of labour. The biggest role in this overwhelming sense of calm and safety was undoubtedly played by our midwife, Rebecca. There are no words that could adequately express our gratitude for her nurturing and wise energy that filled the space of our home the moment she arrived until long after she left. 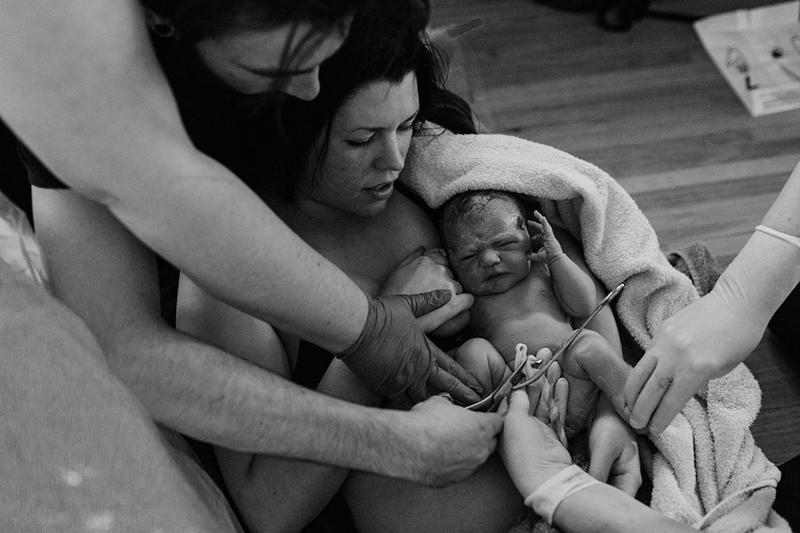 Here we are, just about two weeks after Birdy’s birth, and this experience is still sinking in for us. 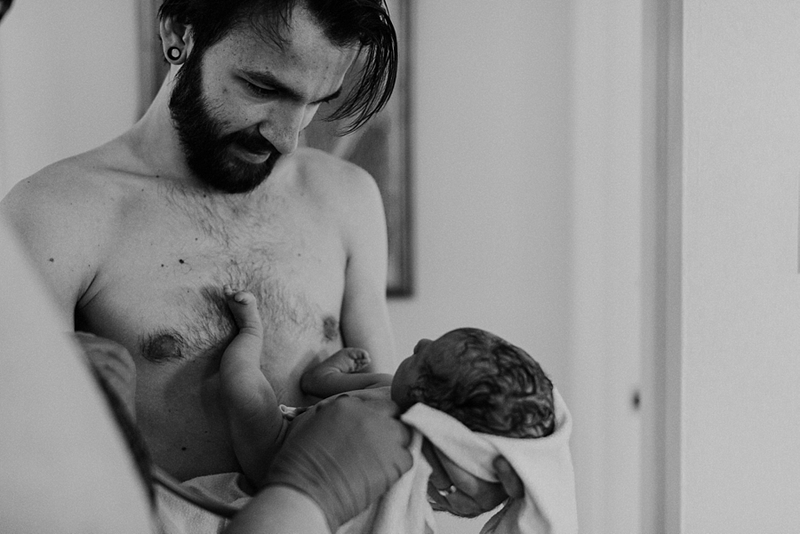 Thank you for being here and for reading all the way through if you’ve made it thus far; because as much as documenting this story is for Mark, Birdy, and I, I also hope that it helps those of you who are potentially considering a homebirth for yourself. If you have any questions about our personal experience, about homebirth in general, or about anything else somewhat related, you’re more than welcome to leave them in the comment section as I plan to do a follow up post to answer any questions in the weeks to come. ***Images in this post were taken by Brittany Esther.